How high should my grow-light be place over the trays? You should set the grow-lights about 2 - 4 inches above the seed starting trays. When is light the most important to my seed starts? The first 5 to 7 days from germination are the most important time. Intense light is needed to prevent the seedling from getting thin and 'leggy". What kind of ratings should my grow-lights have? Minimum ratings are 2100 lumens for light intensity and 5000K for light color. Great numbers are 2750 lumens or higher and 6500K. How long should I keep the grow-light? At germination and for first week, the light should be left on 16 hours and off 8 hours. After that you can start decreasing the lights to 14 hours and then 12 hours over a few weeks. Why do my seedlings get tall and ‘leggy’? Bottom line is the light is not intense enough and they are stretching to get closer too it. When should I turn my lights on? Should I have them on before germination? I turn them on before germination as you want to catch the germinating seedlings immediately with intense light. After planting seeds, I turn my grow light on 3 days later. Nothing really germinates in 3 days. Can I use a window? Do I need grow-lights? You really do need a grow light as 99/100 south facing windows don't provide enough light for seedlings. This is the video that goes over all these questions in more detail. Subscribe to my channel, I will be making real-time garden videos all through 2019. Do I need direct or indirect sun in a window? Sun coming in a window must always be direct. That means the sun can always be seen by your seedlings. Light from the sun directly hits your seed starts. Check the video out for this one. You just have to see them. Do I need to start my transplants in small cells or can I use large cups? It is all based on how much room you have to grow indoors and the number of plants you want to start. You can start in large containers or forgo potting them up from the smaller seed cells if that is what you prefer. Do I need to use seed starting mix? Should I sterilize my starting mix? I always recommend sterilizing your starting mix and using a seed starting mix. I find it really helps with germination and reduces problems. Does sterilizing seed starting mix kill of the soil life? It would, if starting mix had soil life. Seed starting mix doesn't have anything of value for your plants. It is just a seed starting medium. Sterilize it and add what you wish afterwords. Can I use outdoor soil to start my seeds indoors? You can but this risk of bringing in insects, insects eggs, fungus and disease is quite high. There is not Nature indoors to combat problems. Can I use dry seed starting mix to start my seeds or should I pre-moisten the mix? Always pre-moisten your seed starting mixes. They actually float and absorb water slowly if you don't prepare the growing cells or cups with pre-moistened mix. How do I set up my seed starting cells or containers for planting? Check the video out for this one. How often do I water? When do I water? Check out the video for this one. Should I let the top of my seed starting mix dry between watering? It is a good idea to let the tops of the growing cells or cups dry. The video really explains this through examples. Did fungus gnats come because I didn’t let the top of the seed starting mix dry? Nope. Letting the tops dry helps reduce problems but it is not the cause. Fungus gnats lay eggs at the bottom of your starting cells too. How do I water my transplants in the most efficient way? Bottom watering in the tray is the most efficient way and the video describes the process. Can I leave water in the bottom of the trays all the time? You can let it sit for a couple hours while the seed starting mix absorbs it. Really after 30 minutes the mix soaks up all the water it can hold. Dump out the excess water or you can get root rot. How many grow-lights do I need? Again the video explains this thoroughly. Should I use a timer on my grow-lights? Do I need to put fertilizer in the seed starting mix to start? What kind of fertilizer should I use indoors? You don't have too. If you are you should use water soluble fertilizers at 1/4 strength or less. The video will explains why. When should I feed my transplants? How much fertilizer do I use? Water soluble fertilizer of your choice at 1/4 or less recommend strength. You can feed your plants about 1-2 weeks after germination. The video explains why. What is the best temperature to start seeds indoors? About 70 degrees F suits most seeds, if not all of them. Do I need to use a seed starting heat mat? How long do I keep using it? You don't if your growing area sits around 70 degrees F. Heat mats do speed up germination and can be shut off a couple days after germination if you area stays above 65 degrees F.
Should I label my seed starts? What is the best way to label me flats? Unless you have a photographic memory... yes. The video describes a couple options. The Seed Company I Recommend is Everwilde Farms: https://www.everwilde.com/. 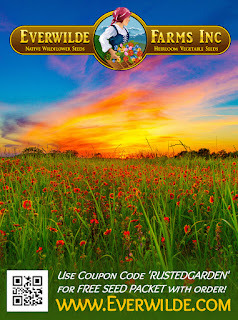 Use the code RUSTEDGARDEN for a free seed pack. No 'THE' in this code. Here is the most recent video from my YouTube Channel: The Rusted Garden. Every year I start new videos that capture my entire gardening season. Right now I am starting seeds. Here is the most recent video. Below is what you would find in the video's description. Please enjoy the video and subscribe to my channel if you like it. Thanks! I show you how to sterilize your seed starting mix with boiling water and discuss the reasons. I answer the question... Why do I need to start my seeds indoors? I go over the different cell sizes and how to set them up with starting mix. I show you the over-seeding method I use for herbs and onions. And I cover some flowers and herbs you can start 10-12 weeks indoors. Please Help Support My Channel: The Rusted Garden - Thanks! Visit The Rusted Garden Seed & Garden Shop: https://www.therustedgarden.com/ - Check out my discounted seed collections & my 'Grow as I Grow' collection. The Truth About Genetically Modified Organisms (GMO's), Hybrids, Heirlooms and Your Vegetable Seeds - Call Them GEO's! All flower and vegetable seeds you buy in seed packs, for a couple of bucks, are not Genetically Modified Organism or GMO's. They never were, currently are not and probably will never be. You have no need to worry when you buy a single pack of seeds. A seed pack stamped Non-GMO is no different than a seed pack not stamped Non-GMO. If you like the reassurance, that is cool, just know what you are paying for via the stamp. The term GMO is basically used to define a genetically engineered organism created in a laboratory in a way Nature could not create it. Why is this important? It is important because hybrids are not GMO's by the above definition. However, genetic material is modified naturally in Nature. The term modified is misleading and confusing, GMO's should really be called GEO's or Genetically Engineered Organisms when a process is done Nature can't do and it is engineered in a laboratory. Nature can create hybrids because hybridizing is nothing more than taking pollen from one plant variety and crossing it to another variety. The plants must be compatible for hybrids to work. I can, you can, bees or other insects can make hybrids. It is 100% safe and normal and it is Nature at work. Genetic material, again, gets modified by Nature. Genetic modification is not bad. GMO's (though they should be called GEO's) take DNA or genetic material from any source and in some cases blast it into the DNA of another source. GMO's are made in many different ways, again in laboratories. This isn't good or bad. It is science, you may or may not agree with it but it important to understand laboratory GMO's are not found in the $2 pack of seeds you buy. They are, however, in the food you sometimes eat. So don't worry. GMO's are huge money makers and there are only about a dozen or two GMO vegetables out there. You have to buy them in larger quantities that easily costs thousands and thousands of dollars, you have to sign contracts to manage the seeds, you can't package and resell the seeds and you have to be a larger scale farm. So... GMO is a bad term because it confuses people A hybrid is taking pollen (natural and normal genetic material) from one plant and crossing it with another plant's natural and normal genetic material. Tomato to tomato. Pepper to pepper. Melons to melons. Roses to roses and the most famous reindeer of all is Pea to Pea. Look up Gregor Mendel as he is the scientist and geneticist that worked on pea hybrids and cross pollination. Taking pollen and crossing it, does genetically modify the plant in a safe and normal way. That is what confuses people. Plant hybridizers copy the way Nature does it. Hybrids are not the above definition of laboratory GMO's. Hybrids work by taking pollen and crossing it, as mentioned. The first generation of seeds, from the initial cross pollination, will have mixed characteristics (genetic material) from both varieties. Those seeds when planted, will give you the 'new' variety with crossed characteristics from both plants. In a sense their genetic material was modified. In (very) brief, the new variety is not a stable cultivar, so when you save the second generation of seeds you won't get (100% of the time) the plant from which you saved the seeds. Hybridizers spend years continuing generations of the 'crossing' to get a stable cultivar. A stable cultivar means when you save the seeds of a tomato and plant those seeds, you get the same variety of tomato. Seeds after seeds, year after year, you get the same variety and characteristics. The plant is stable and called true to form. You always get the true form of the plant from which you saved the seeds. Heirlooms are stable vegetables/cultivars. You always get the same type of plant and characteristics when you save and plant the seeds. Heirlooms are basically plant varieties/seeds (depending on what definition you use) that have been around 25, 50, 75 or even 100 years. They are old and stable plant varieties but the definition on the number of years varies. In some case old original hybrids that were made and stabilized in the 1950's are considered heirlooms today. The summary... Genetically Modified Organisms (GMO's) are genetically modified in a lab in a way Nature can not do it. They should be called Genetically Engineered Organisms (GEO's). Hybrids are made by crossing pollen or genetic material in a way that mimics Nature and it is a natural process. People just take the randomness out of it. Heirlooms are old and stable varieties of vegetables and flowers. I just set up a new Amazon Shop that holds many of the products I used in my 2018 YT videos. The shop is a great way to consolidate the items you see in my videos and that I use, in one place. You no longer have to click links all over the place in different videos, you can now go directly to my: The Rusted Garden Amazon Influencer Shop . Products that show up in my 2019 videos, will be placed in this shop. You can start your herbs, flowers and vegetables indoors weeks before the plants are ready to go out into your garden. Growing your own transplants will save you a lot of money and it really isn't that hard to do. On key, when building your own box, is making sure the plants get enough intense light. A do-it-yourself grow-light box is easy to make and it doesn't have to be expensive. You can get the supplies at just about any big box store. I will also link my Amazon Shop where you can find some of the supplies: The Rusted Garden Amazon Shop. My video shows you all the steps, parts and costs to build your grow-light box. Many people think you need to buy expensive grow-lights. There is no real difference between grow-lights and standard LED and CFL bulbs for growing transplants. You just need to know which bulbs to buy. You can pick up standard clamp lights and bulbs to make your basic box. The bulbs should be 1600 lumens or higher and they should have a Kelvin rating between 5000K and 6500K. The lumens value is light intensity and the Kelvin rating is the color of light. You want daylight. You can see in the picture they really aren't that expensive. If you were to buy them as 'grow lights' you can pay 2 and 3 times as much. Again, my video will show you all the steps. I recommend getting seed seed starting flats and cells. Make sure the storage box you buy for your build can hold a seed flat tray. After all you want to be able to easily drop your seed starts in and out of your self made grow-light box! You can find my seed collection 'Grow as I Grow' and the seed starting flats and cells at my seed shop The Rusted Garden.